Symvan was one of eight fund managers presenting in Sandy Park, Exeter on 5th December on the joys of tax-efficient fund investing. 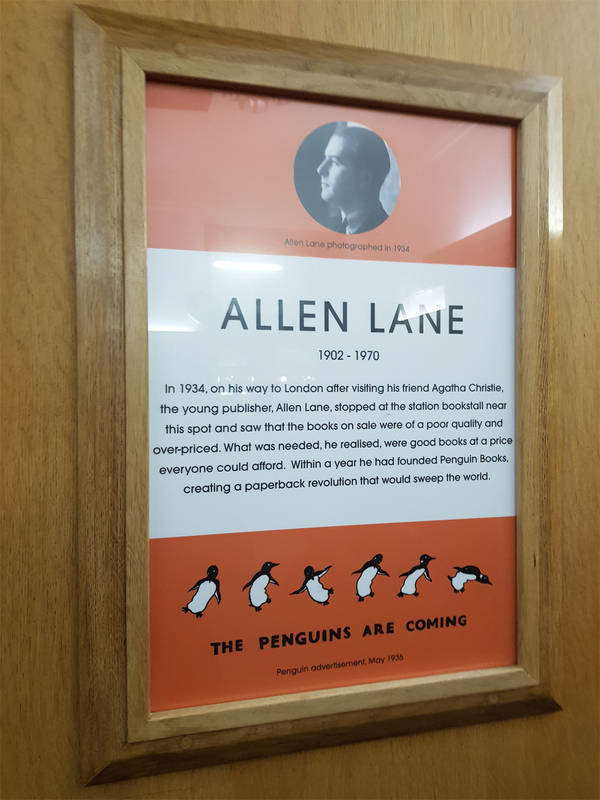 Upon arriving at Exeter station, I was waiting for a connecting local train with my colleague, Spencer Krett, when we noticed something quite extraordinary, which was a plaque/poster located at the spot where a young Allen Lane decided to found Penguin books in 1934 after having visited his friend Agatha Christie (see picture). With an insight that would be emulated by many entrepreneurs since, he realised that there was a crying need for a high-quality and innovative product (i.e. paperback books) at a suitably low price that everyone could afford. The spirit of Allen Lane lives on in Exeter where we encountered a group of investors the next day who seemed to readily grasp the basic insight of venture capital investing, namely that it is outsized single stock gains that are what drive your portfolio returns. The audience also seemed to grasp the concomitant point, which is that venture capital should form a part of most investment portfolios irrespective of tax relief. The Patient Capital Review has rudely and justifiably turned the tax-efficient sector upside down. Gone are the days when an investor could buy equity products dressed up in fixed income risk clothes and marketed solely as a vehicle for tax relief. The Treasury is very clear that future investors in EIS/VCT products should ideally be investing in companies that are taking the entrepreneurial challenge from the UK to the world – as Penguin did in the 1930s. It was a thread of argumentation that seemed to impress the Exeter audience somewhat more than in other parts of the country, which led me to believe that the train station offered some insights into the disposition of West Country investors. In particular, during a Q&A session with all of the fund managers just near the end of the presentation, several questioners seemed intent on divining the long-term prospects for Bitcoin. The other representatives did not wish to offer a strong opinion either way, which is unsurprising given that they are marketing experts, whereas Symvan gamely insists on getting the fund managers in the line of fire with the audience. In response to the question, I unhesitatingly stated that it was a bubble worthy of study by Charles Kindleberger, and that an investor should immediately sell. Despite the 50% fall in the price of Bitcoin since that time (i.e. less than two months), it would be churlish to assume that I was being prescient in any sense of the word. Relatively well-read in the history of financial crises perhaps, but certainly not an expert in market timing and investment bubbles. One does not need the insight of a Maynard Keynes (“The market can remain irrational longer than you can remain solvent”) to understand that financial bubbles always pop, just not according to any discernible circadian rhythm. So, who are these 4 percent and how does one identify them? For the US stock market over the past decade, a considerable amount of that growth was generated unsurprisingly by companies (all archetypal ‘start-ups’) that have come to exert huge global influence – Facebook, Amazon, Apple, Google, Netflix, Microsoft – but capturing that magic ‘4 percent’ going forth probably involves finding the new generation of start-ups who are looking to scale-up. I doubt that anyone would recommend allocating all of one’s portfolio to either small cap listed equities or growth EIS funds, and long term investing in index tracking products will give you access to the magical ‘4 per cent club’ by default. Large cap equity investing is a proven winner for long term investors. Yet it is another reminder that it is precisely the smaller growth companies that offer investors the chance to generate real additional ‘alpha’ which – as the compounding example above reminds us – can make an enormous difference to the level of retirement benefits received by investors. Moreover, an investment into a high growth EIS fund (or better still, spread across a few dynamic fund managers) offers advantages that are not accessible to small/medium cap fund managers. These funds are discretionary funds whereby the investor is the beneficial owner of the equity in question, thereby allowing the investor to continue to back specific stocks as they grow and develop. It is getting in at an early stage that is said to account for the competitive advantage of California venture capitalists by some seasoned observers. All of this is to say that investors should be over the moon with the recent changes in EIS & VCT legislation. Tax-efficient investors have suffered for far too long from products that generate next to no return and allow fund managers to make more money off an investment through the fees they charge than the investors make in a return on their money. In effect, the Treasury is nudging investors and their advisers towards better investment outcomes and hopefully shifting the industry focus from a preoccupation with assets under management and date of fund manager inception towards what really matters to investors – investment performance and fees. PostScript: in addition to revolutionising the size and accessibility of the book market globally, Allen Lane was also responsible for being the first publisher of James Joyce’s Ulysses and D.H. Lawrence’s Lady Chatterley’s Lover, despite the threat of prosecution in both cases. Moreover, his first distribution outlet in London’s Charing Cross station was called the “Penguincubator.” You couldn’t write it. Symvan Capital is proud to announce the launch of its third SEIS fund – the Symvan Technology SEIS Fund 3.